In recent years the Eastry Remembrance Sunday has had visitors from Longpré to mark the day with us; this year was no exception. Jean-Marc, Alain and Mary-Jane from the Twinning Association and Cyril and Becky representing the town council came to the service at St Mary's Church. 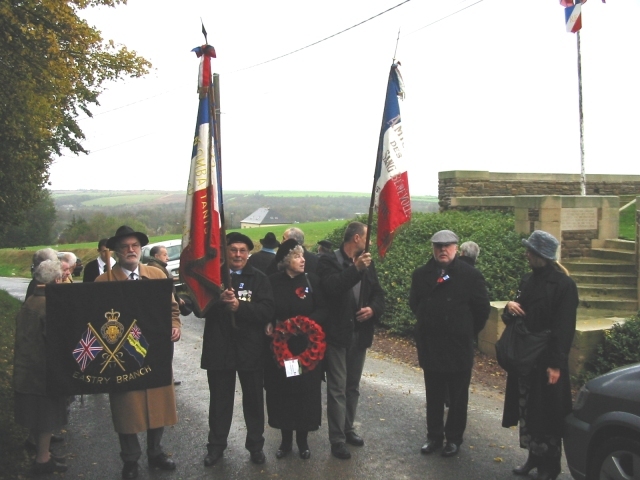 The difference this year was that a delegation from Eastry travelled to Longpré to attend their remembrance day service and parade. November 11th is a public holiday in France and they have their commemoration on that day whereas we mark the day on the nearest Sunday to November the 11th. So on Saturday morning at 6am Nick, Terry, Bill, Robin and Peta set off for Longpré via the tunnel. We were due in Longpré at 10.15 therefore the early start was necessary owing to the 1 hour time difference. The roads were clear and we got there in good time. Joining the gathering crowds with wreaths at the Hotel de Ville, we joined a smaller party and made our way to the British cemetery ~half a kilometre from the centre. 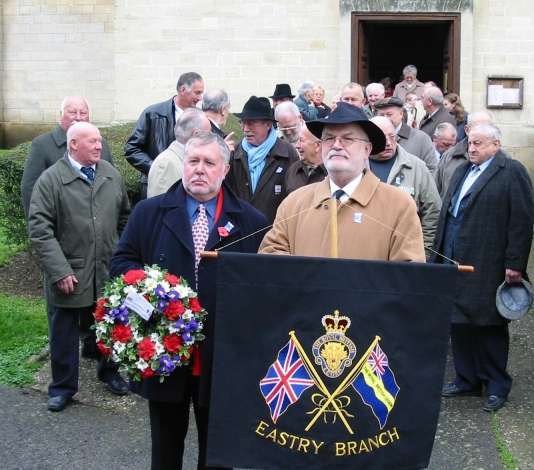 Peta laid a wreath of poppies and Bill carried the Royal British Legion, Eastry Branch banner. After a minute's silence we made our way back to the centre and on to the church for the service. The church service was interesting, trying to follow what was going on with my very limited French, luckily an order of service gave me some clues as to where we were in the proceedings! The service ended and we left the church to join a procession to the WW1 cemetery, following a van with a loud speaker mounted on the rear to supply the marching music. After speeches from various dignitaries and veterans, and a few moments of silent reflection, wreaths were laid; ours by Terry James, and posies of red, white and blue carnations by local children. The children featured prominently: after laying their flowers they gathered to sing the Marseillaise. 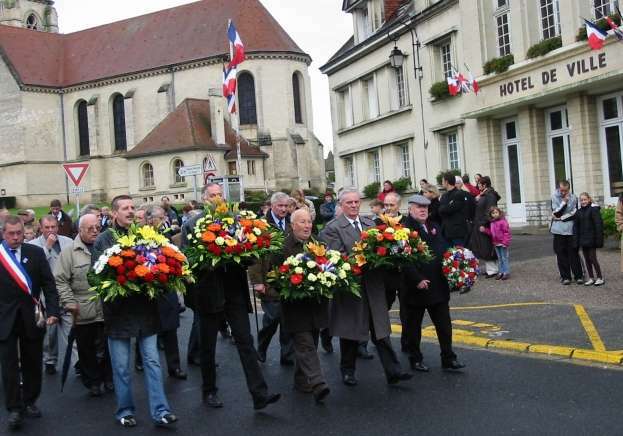 We were welcomed in the speech by the Mairie and then 'God Save the Queen' was played through the sound system. One lighter moment was when Bill Clague removed his hat for our National anthem, then replaced it as the music died away, only to have to remove it again when the 2nd verse started up, a performance he repeated for the 3rd verse - he got wise after that and waited until he was sure it had stopped! Proceeding to the WW1 cemetery. We set off again, behind the loudspeaker bearing van, to the WWII cemetery and more wreaths and flowers were laid, and the young children sang again; the final procession took us back to the Hotel de Ville and this being France, everyone was invited inside for aperitifs and snacks! It was an interesting experience and one I would recommend to anyone if they get the opportunity to go another time. I would like to also take the opportunity to thank Jean-Marc and Patricia for their hospitality, providing Terry and myself with a delicious lunch, and on behalf of Bill, Peta and Robin to thank their respective hosts. Click here for more photographs of the trip and the visit the following day made by the French to Eastry.